The University welcomes a new wind farm in regional Victoria that has started supplying clean energy across the state. 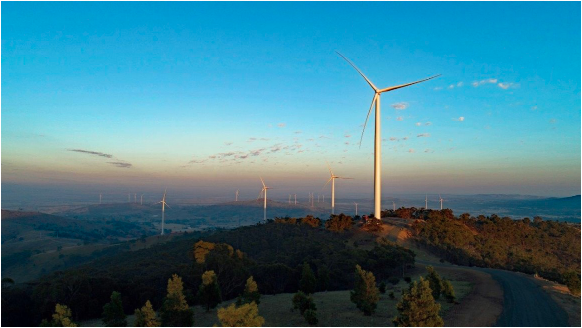 The University of Melbourne welcomes the operation of a new wind farm in regional Victoria that has commenced the supply of clean energy across the state. The University and 13 other partners in the Melbourne Renewal Energy Project combined their purchasing power to support the construction of the 80 MW windfarm at Crowlands, near Ararat. The agreement is the first of its kind in Australia and, as a result, Melbourne is the first capital city council powered by 100 per cent renewable energy. University of Melbourne Associate Director Sustainability Clare Walker said the University is proud to be a partner in the MREP. “Generation from Crowlands windfarm demonstrates the opportunity for organisations to secure long-term electricity supply in an economic and environmentally sustainable manner. This project supports Victoria’s efforts to transition beyond its dependence on fossil fuels,” Ms Walker said. The University’s Sustainability Plan 2017-2020 includes targets to reach zero net emissions by 2021 and achieve carbon neutrality before 2030. Power purchase agreements such as the MREP leave the University well placed to meet these targets. “The MREP complements energy projects already undertaken at the University," Ms Walker said. “They include the installation of solar photovoltaics, energy reduction and efficiency of heating, as well as ventilation and cooling, lighting, and management of building automation systems. "Most importantly, all of these projects show the University has a strong institutional commitment to sustainability."